Review: Calling all Sherlock Holmes fans: this incredibly very well-written book with classic characters like Dr. John Watson, Sherlock Holmes, and Professor James Moriarty by author David Stuart Davies will fulfill your “Who done It” reading pleasures. 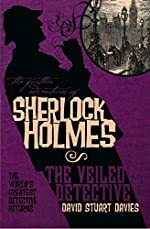 The book's title is The Further Adventures of Sherlock Holmes: The Veiled Detective. This is the first book of the re-released series. This mystery book is filled with action and adventure , I assure you that all your senses will be awakened. The initial setting of the story is in Afghanistan circa 1880 where a drunk army medic named Dr. John Walker is dishonorably discharged from the army due to his inability to follow Army directives. During his journey back to England, he meets Captain Reed a professional thief who was also dishonorably discharged from the Army. As Dr John Walker was looking forward to a better future in England, Captain Reed Offered him employment and he accepted without due diligence. It turns out that Captain Reed was a senior operative of Professor Moriarty, also known as 'The Napoleon of Crime' in London. Professor Moriarty's crime syndicate was centered in London and some of his criminal schemes were undermined by a Witty detective named Sherlock Holmes. The sharp mind of Sherlock Holmes did not go unnoticed by Professor Moriarty, he found Sherlock Holmes intellect up to par with his. To keep a tab on Sherlock Holmes, Professor Moriarty devises a plan to spy on him, he decides to send Dr. John Walker in disguise as Dr. John Watson to become Sherlock Holmes friend and future roommate. As time passes and Dr. Watson gets to know Sherlock Holmes really well, he finds a true friend in Sherlock Holmes. This new friendship leads to Dr. Watson rejecting Professor Moriarty's devious plans knowing that the consequences will be dire. Will Sherlock Holmes outwit his most cunning adversary? Or will he perish and leave all of London in peril? We would like to thank Titan Books for providing a copy of The Veiled Detective for this review. Have you read The Veiled Detective? How would you rate it? By far the best review i have ever seen. The book was amzing I agree with our every word.